Enrich your knowledge in garage doors and their components by using our dedicated FAQ page. Our team places major importance on the safe use of these facilities and on the proper care for them. For this, we strive to provide as much valuable information and advice as possible to all users. Why can’t I wait to replace my garage door springs? It is very dangerous to have worn garage door springs. Your springs hold the weight of your garage door. If they should happen to break, unexpectedly, you could be harmed or killed. This is something that should be taken care of quickly to avoid harm. Will I be able to get after hours help? Yes. 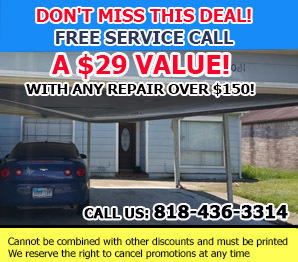 The most reputable garage door services, such as, Garage Door Repair Agoura Hills offers emergency garage door services. If you work late at night and return home only to find your doors will not open, after hour services are offered.